Super Savings Item! 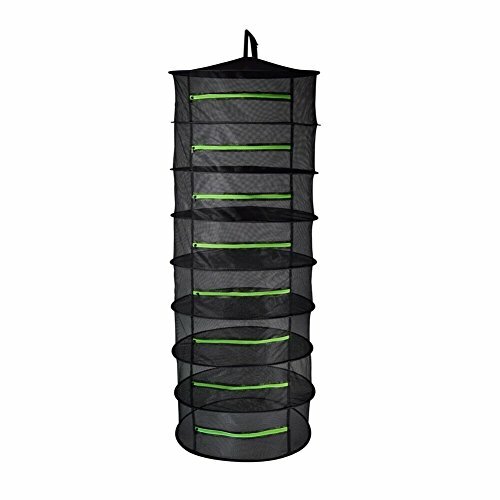 Save 36% on the BoHoFarm Herb Drying Rack Herb Dryer Net w/Zippers Black Mesh Tray Dry Flowers Buds (D24 xH67 8-Tier, Black w/green zippers) by BoHoFarm at Tulips Orchids. MPN: BH-DN-035. Hurry! Limited time offer. Offer valid only while supplies last. OUR HERB DRYING RACK GIVE THE BEST WAY FOR DRYING LEMONGRASS,LAVENDER,MINTS,OREGANO,SAGE,THYME,ROSEMARY,VIETNAMESE CORIANDER,LAVENDER,BAY LAUREL. OUR HERB DRYING RACK GIVE THE BEST WAY FOR DRYING LEMONGRASS,LAVENDER,MINTS,OREGANO,SAGE,THYME,ROSEMARY,VIETNAMESE CORIANDER,LAVENDER,BAY LAUREL. KEEP THE CRAWLERS OUT,WITHOUT BASIL,FLIES OR BUGS GETTING IN,WORRY-FREE FOR THE STRONG WIND. Note: The trays were tied together in the zippered storage pouch.When you open the zipper bag,they will all SPRING OPEN.Please KEEP AWAY FROM YOUR FACE TO AVOID HURTING. If you want to put the Hanging Drying Net in the bag, please see above picture guide. Durable Non-toxic-nylon mesh fabric for years of trouble-free use. High-quality elastic steel to provide sturdy support. You can hang the Drying Net from ceiling and turn your ventilation system on to keep perfect drying effect. When used with your existing exhaust fan and carbon filter,the generated air movement in your grow room can quicken the drying process,without dispersing odors into the outside environment. Enclosed zipper dry net can prevent bird,insects. ▲The best way for drying lemongrass,lavender,mints,oregano, sage,thyme,rosemary,vietnamese coriander,lavender,bay laurel. ▲Weight capacity of the dry net: 4.5lb per layer. ▲Worry-free for strong wind,bugs or the thieves with fur,choose the drying net with zippers. ▲Easy to carry with a Black zippered storage bag. ▲The herb drying rack Can be hanged from the ceiling of grow room or grow tent. If you have any questions about this product by BoHoFarm, contact us by completing and submitting the form below. If you are looking for a specif part number, please include it with your message.